PCD Pharma Franchise in Mizoram – Take up monopoly pharma franchise in Aizwal, Kolasib, Lawngtlai etc at most genuine investment plans! Top Pharma Franchise Company in India’ Biofield Pharma invites people from all over northeast India to become a part of our PCD pharma franchise in Mizoram. We are offering 300+ pharmaceuticals drugs for PCD franchise business. These include tablets, capsules, injection medicines, syrups, ointments, soft gels, caplets, oral suspensions etc. Starting your business is a dream of millions and Biofield Pharma gives you this opportunity to accomplish your dream. We are a well known PCD franchise company that provides genuine business dealerships across the nation. Northeast has a good demand for our products. Thus, we bring your PCD pharma franchise in Mizoram. We are offering specialized division PCD franchise cover markets like pediatric, diabetic, nutraceuticals, orthopedic, general medicines, dermatology etc. The deals are flexible. You will be given monopoly business rights over the business location by the company. We assure you to deliver quality drugs and better opportunities as PCD franchise businessman. Want to know more about our PCD franchise deals near you in Mizoram? Dial +91-9216300566, +91-9216300166 and have a full conversation with our company representative to know more. You can even choose to chat through our live chat system or email your queries at info@biofieldpharma.com. Our company promises better business scope in Mizoram along with a variety of benefits. Mizoram is one of the well-known pharma hubs of northeast India. With the ending of taxation holidays in multiple areas like Baddi and Himachal Pradesh, the northeastern states are proposed to be the next best place to start a venture. The government has extended its hands to promote those states and Mizoram is one of them. The exotic location, good manpower, resources, and utility have helped attract many companies to start their ventures here. Many have already started their branches and units to take full advantage of Mizoram pharma industry. The advancements in the healthcare industry have started to reflect in Mizoram which is helping provide more awareness among the public. More masses are getting engaged in the pharmaceuticals and healthcare sector which is making medication and healthcare facilities feasible. Economic growth has added to the increased value for medicines among the general masses who et the urge of spending on better medicines. The number of hospitals and clinics along with pharmacies has helped turntable towards the better commitment to PCD franchise business. Government schemes to strengthen northeast pharmaceuticals sector has been a lot appreciated and it has helped add value to pharma businesses in Mizoram. How Is Mizoram ‘Best Place To Start Pharmaceuticals Business? The Mizoram government has proposed various schemes and policies to promote industry and business here. Pharma industry is one of the biggest ones. The intensive propagation of healthcare and medicines rights has helped increase the demand among the public. People from nearby towns and small cities heavily rely on good cities where they can be provided with medical and hospital facilities. Mizoram has good medical facilities being provided in the northeast. The good economy of the state is a sign that the people are willing to spend on quality medicines. This makes PCD pharma franchise a good business for all. Many of multi-million Pharma Companies have shown their interest in investing in Mizoram. The government is initiating regulations in the Pharma sector in Mizoram for better growth prospects in future attracting potential interests. Our company is based in Chandigarh. We are a well-known pharma franchise company that works all over India. With above 300+ associates linked together as PCD pharma franchise members, Biofield Pharma is a homegrown Pharma Company. Thousands of customers are spread in each corner of this nation. By becoming a member of our company, you will get good opportunities and growth scope. In Mizoram PCD pharma franchise, you will get various choices to which business you want to start. You can choose to start a general business and claim to over multiple dosage forms. If you want specialized divisions then also we have good provisions for you. We specialize in over 300+ medicines from market segments like cardiology, diabetic, pediatric, dermatology, orthopedic, ophthalmic, dental medicines etc. you are most welcome to choose from hundreds of variety at a great price at Biofield Pharma for PCD pharma franchise in Mizoram. 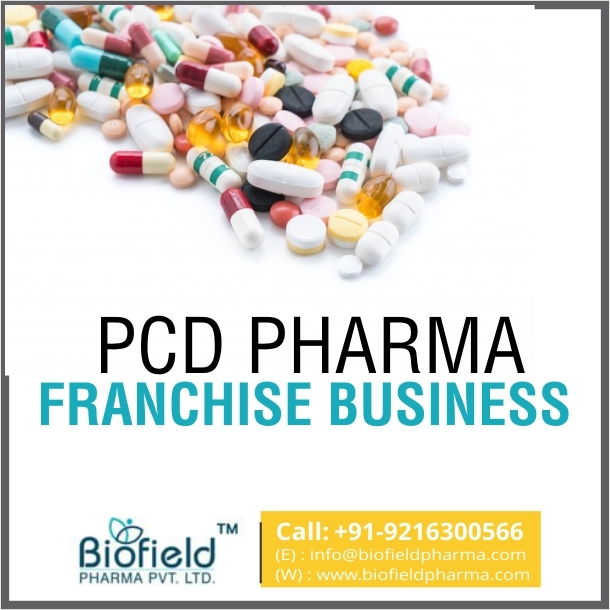 Be A PCD Pharma Franchise Member of Leading Franchise Company Biofield Pharma in Mizoram! Extraordinary pricing approach pursued by our organization. Engaging promotional tools that take care of your advertising requests. Extraordinary nature of medication prescriptions. Every one of them is DCGI affirmed made in GMP-WHO units. The market degree is great and we continue presenting new items. At, Biofield Pharma Franchise dealerships, you will not only get to set up your own business but provide a rainbow-like future to your career.